Hi, I have used your transparent stains in the past on my cedar sauna, cedar smimming pool and on a red west pine deck. I wish to now go with the semi-transparent stain. Is it ok if I clean and brighten or do I need to strip? Clean and brighten is fine. I have a large pressure treated sienna brown deck, pergola and fence. It was built two years ago. I have ordered samples to try and a rad kit. Should I sand or is the kit prep enough before staining? No need to sand. Just use the prep. It says to wait 1-2 days before staining, how long is too long to wait? New 600 sf second story Cedar deck installed on my home early last summer, 4 months later cleaned it with Restore-A-Deck which left a clumpy mess on underside of deck, siding on house below, the patio and damaged some of the glass on the windows below per professional window cleaner. Stained with one coat of Armstrong Clark semi-transparent stain 4 months after installed. 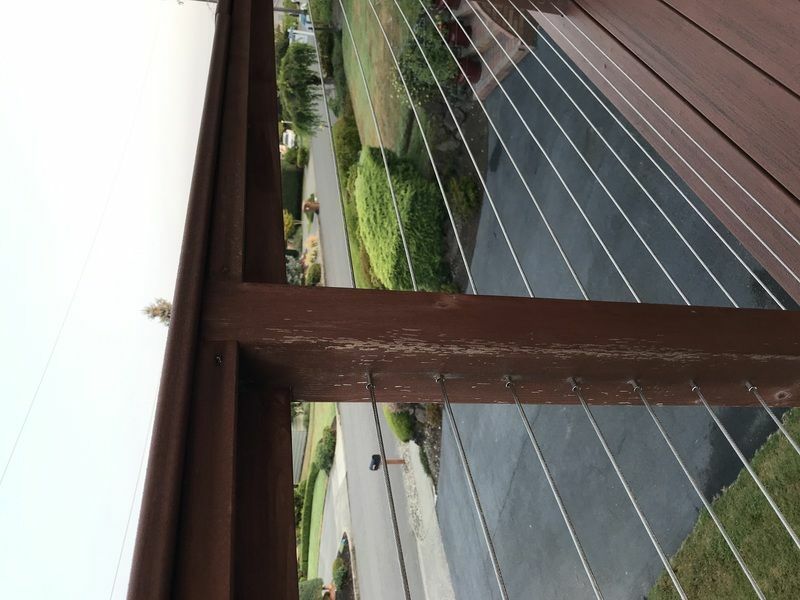 The deck stain still looks really good (no mold/mildew/gray) but since it only has one coat of stain on it I want to put another coat on this summer. 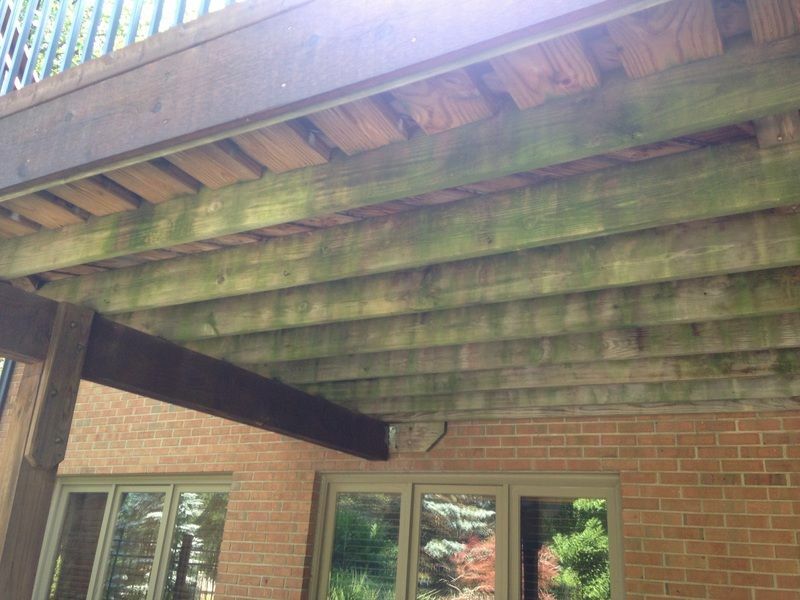 What can I use to clean the deck and avoid the clumpy mess on the underside of deck, siding below, patio below and damage to windows? I'm thinking after this summer I should be able to clean/stain it every other summer. Use the RAD cleaner again but mix at half (about 2-4 oz per gallon) strength. Apply and lightly pressure rinse. 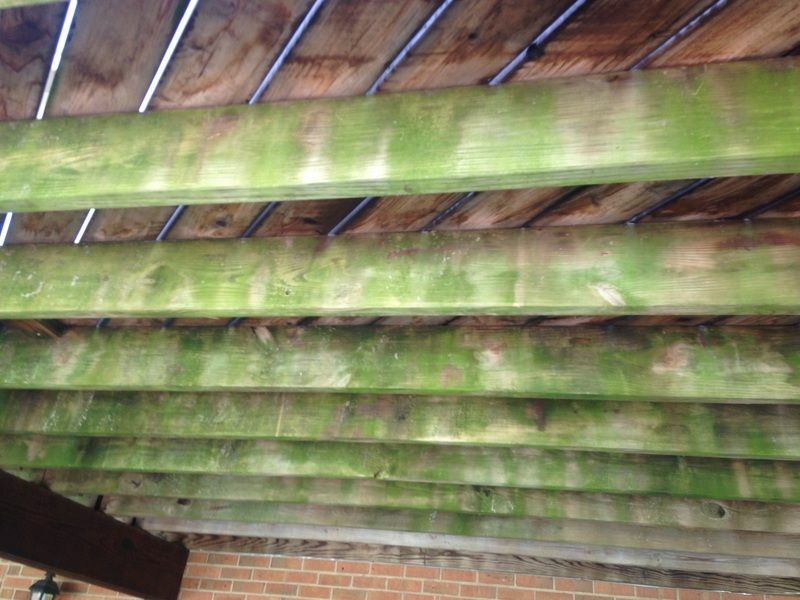 The "clumps" you had before was from the removal of the oxidation/graying of the wood. When doing maintenance coats, you do not have this issue. Thanks. So I should use the cleaner and brightener 2 step process each at half strength. Not waiting will most likely result in premature failure and or improper curing. This picture is of ipe after cleaning and brightening and then rain. No stain. The customer would like this color. I tried a sample of mahogany but it makes it too brown. Is there a lighter red tone that will get it closer to the picture? 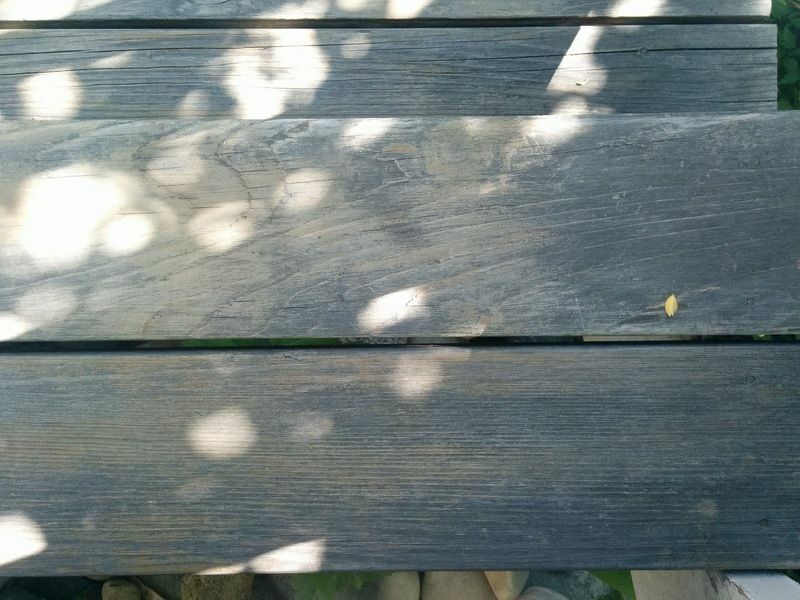 I think I may already know the answer to this question, but I have a Cypress deck in Eastern Missouri, that was previously stained with some unmentionable product and I have pressure washed the "majority" of the old stain off, but there are blotches where the old stain did not come up. 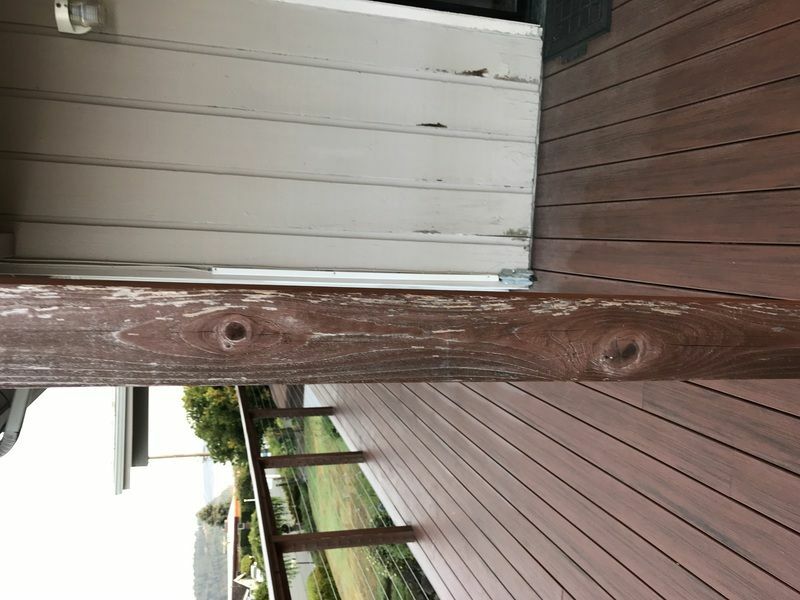 Do I absolutely have to remove 100% of the old stain for AC semi-solid stain to correctly cover exposed wood and some wood with old stain still present, but "roughed" up with intense pressure washing? Yes, you need to remove the old stain. shoot for 95% or more. Can I mix some Mildewcide into the semi-transparent? No need. The AC already contains the maximum amount. 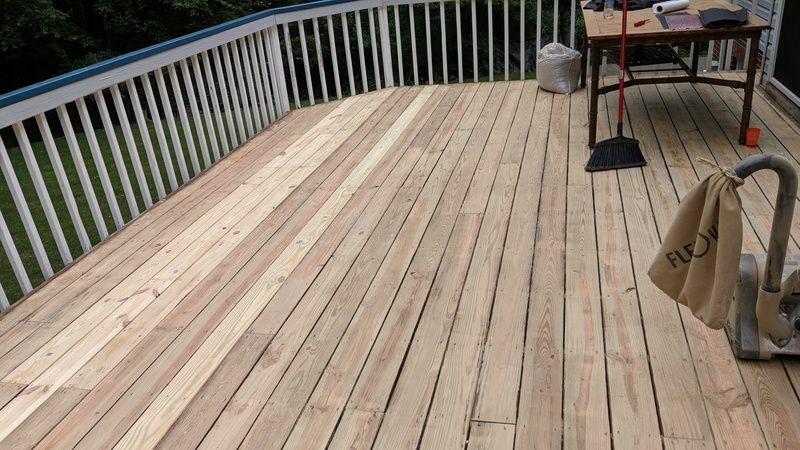 I am in the process of refinishing my deck here in Northwestern PA, I have completely sanded down to bare wood all the decking and replaced about 10 or 12 boards with new pressure treated lumber. The new lumber has been exposed to the weather for about 3 1/2 to 4 months at this time and appears to be absorbing water now. I have purchased an Armstrong Clark Stain Kit which includes the cleaner and brightener. Originally I was going to apply the stain this fall but I am now leaning towards waiting until spring. I am considering this because since I need to clean and treat the deck before the stain I will need to clean and scrub again in the spring whether I stain or not. Will I do any harm or cause myself even more work by waiting to stain until the spring time? You will be fine if you wait until Spring. One Winter will not harm the wood. 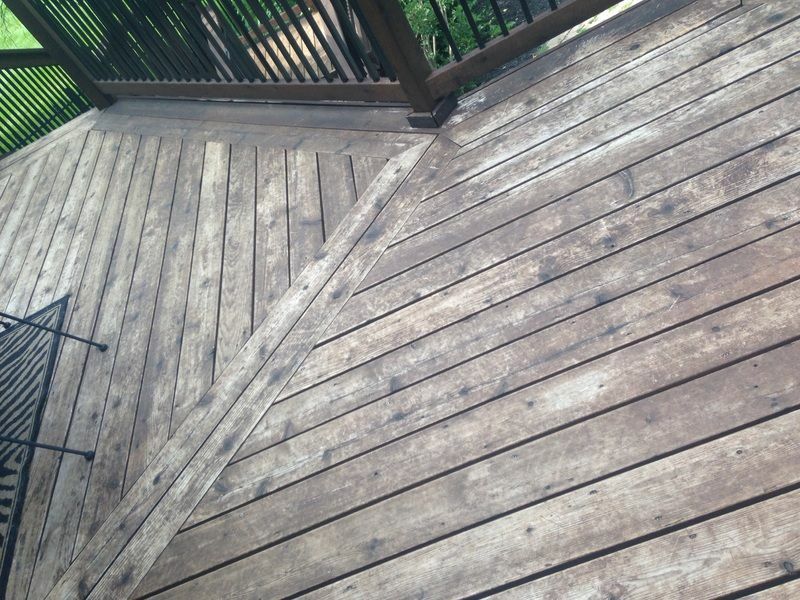 Should the deck be slightly damp before applying the cleaner solution with a sprayer? The instructions appear to indicate that, so I wanted to confirm before I start. FWIW-- I will be using a deck scrubbing brush and garden hose to rinse afterwards. It can be damp or dry when you start the prep. Hard to say as the spindles are not all made the same. Best to test first. Typically there are no issues. I'm freaking out! After sanding the gray off my Ipe deck it looked beautiful...nice reddish brown coloring. Last night I used the RAD cleaner and brightener, and the gorgeous red colors seem to have been bleached right out! It's very light now with none of the warm tones. Will be using the mahogany stain on it but now I'm worried I won't get the warm red tones back. ? It will be fine once stained. Hi. I installed an Ipe deck last August. I was going to stain it in the Spring but things got in the way and it didn't happen, so it turned grey. I sanded it last week with 60grit. Was going to clean and brighten Thursday and stain Sunday. Forecast says possible rain Saturday morning though. Do I have to have 2 full days of no rain before I can stain (and another day after), or if it looks dry Sunday can I still stain Sunday? Yes, you will need to wait 48 hours after the rain to be safe. No. 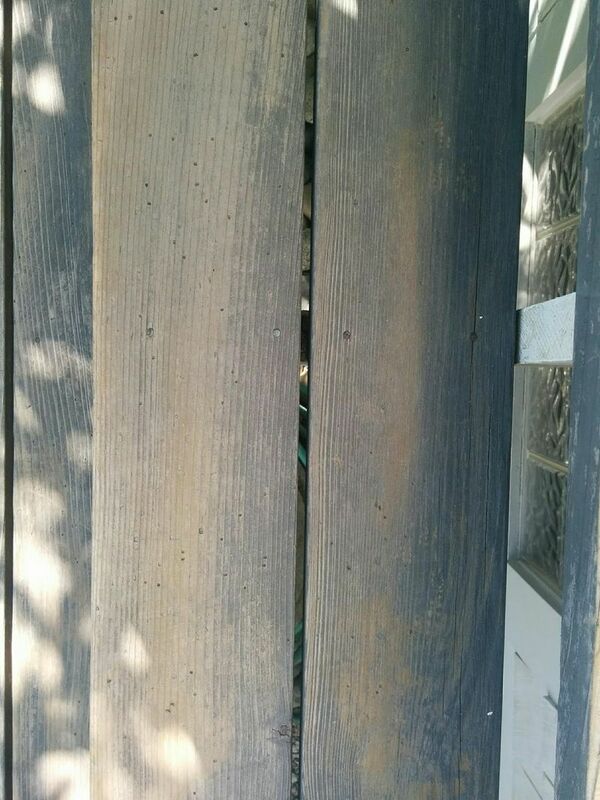 Wood filler will not work on exterior wood and the filler will not blend with the AC stain. It will look very bad. To restain a deck with previously used stain do you need to clean and brighten or just clean before applying same stain as used before? Also, can pressure washing be skipped in the cleaning process? Does the cleaning product contain oxalic acid? 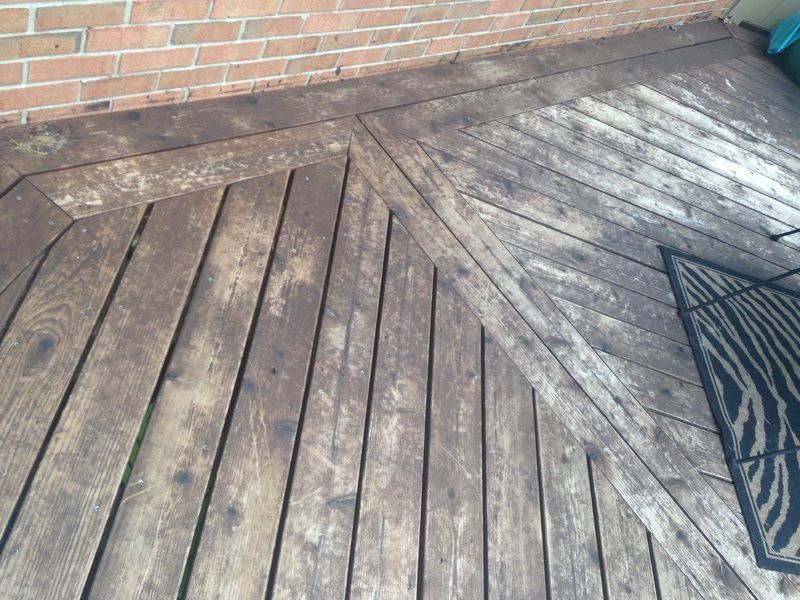 Depends on how long it has been but typically you can just use the RAD deck cleaner with pressure washing. The cleaner does not contain oxalic acid. Just trying to get the sequence right. I am sanding sapele deck to bare wood and using semi-trans mahogany. Do I sand 1st then then wash and brightener or in reverse? Sand, clean, and then brighten. Can you wait longer than 1-2 days after cleaning and brightening the deck to apply stain. If so how long can you wait? Stain within 2 weeks of the prep for best results. 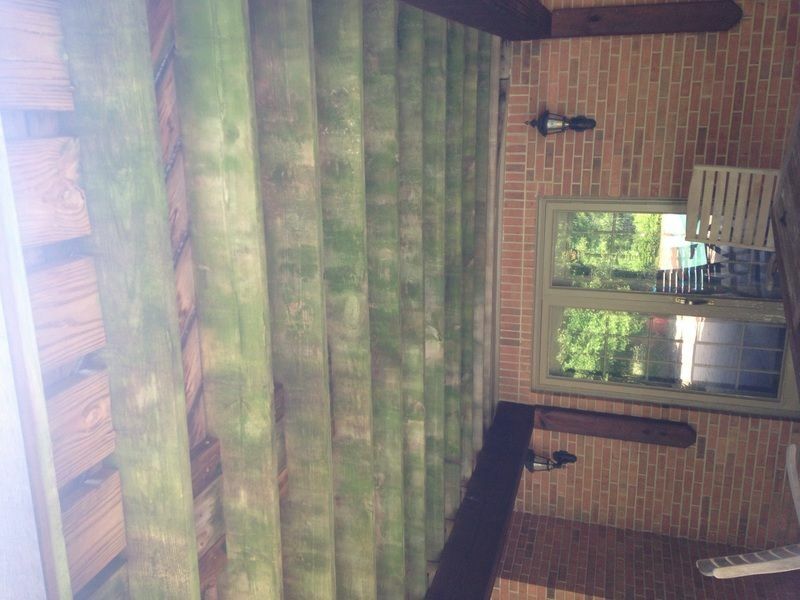 Our deck, railings and fence were stained 2-3 years ago with a water based stain. The company has gone out of business. What kind of prep do you recommend we use prior to applying an Armstrong Clark stain? 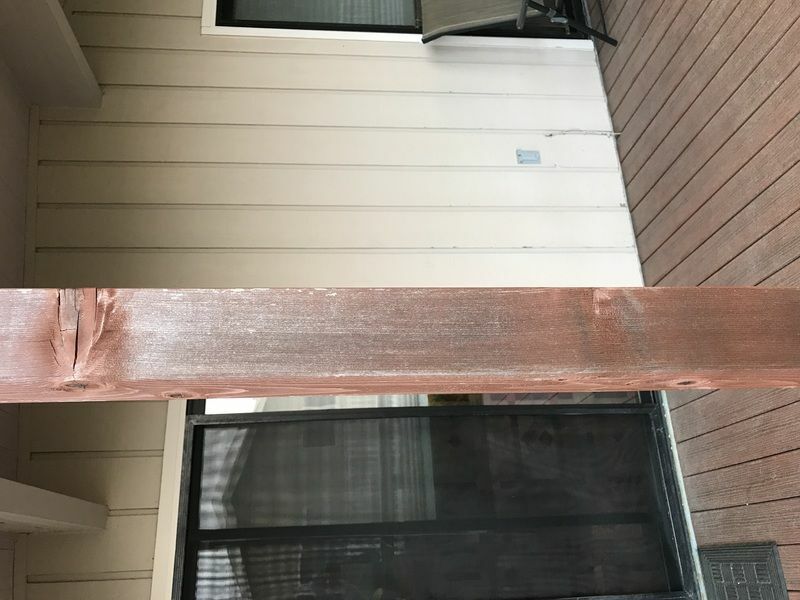 There is primarily wear on the posts from sun & rain (we live in the Seattle area) and more significant wear on the fence. Thanks for your help! You will have to remove it but not all stains are strippable. Can you post a picture? The deck is Trex so it’s the posts we need to stain as well as some cedar fencing. Sand if needed any areas that cannot be fully stripped. Can you recommend an additive I can mix into AC stain to protect against termites, carpenter ants, and similar pests? There is a product called "Bug Juice" that works. My cedar deck was installed in 2015/July - stained with AC Rustic Brown in September. A single coat was applied by brush with the promise the co would return the following year to apply a 2nd coat and clean the deck. Well 2 of the railings blew off due to poor workmanship and were finally repaired mid summer.. by the time I could schedule all of this the stain co schedule was full (both companies work together). So in 2017 June, with a few complaints to the owner (having been paid upfront in 2015) they came to apply the 2nd coat. They apparently applied a brightener /stripper that must have removed the previous stain and provided poor adhesion to the 2nd coat. 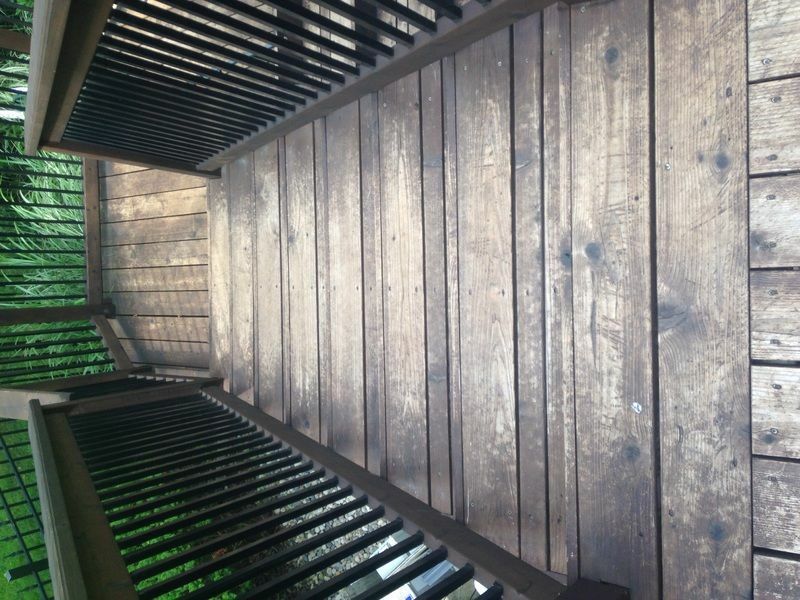 Additionally there was a lot of fuzz and debris on the underside of the deck that I am still trying to clean off since it is a 15ft elevation.. Now I'm left with stain that is wearing off in a blotchy pattern even in non high traffic areas. So I refuse to hire this out again.. the owner of the co didn't care.. so diy here I come. I chose your product for ease of maintenance and believe the product did not fail here. Please lmk what steps to take for proper removal and reapplication. It looks like a restore kit and power washing which I hate to do on newer wood.. then sanding etc.. This will restore down to the bare wood so the AC will properly perform. I think you only answered the question to support the upper side of the floor decking.. what do you recommend for the underside of the deck boards? I plan to stain those but now have algae and the residue from the last prep. Obviously 15 ft up poses a challenge. Regarding the stain application, do you recommend 1 or 2 coats per season? And what is the best way to apply this roller or brush? There is no reason or need to stain the undersides unless you want to for appearance only. If so, yhou will need to clean/brighten for the prep. Yes it is for the appearance.. this area is currently an unfinished outdoor living area that serves the pool. So just to be sure, your cleaner and brightener will remove the algae.. Yes, it should remove most if not all. The only issue would be if the algae is deeply embedded into the wood. 2 coats wet on wet for initial application, redo with 1 coat as needed. If I use AC semi-transparent, I understand that it will fade after a time and I will need to re-apply. Will the wood gray and need to be sanded again? We will need a picture to see if you will need to strip and or sand to remove the previous coatings. As for amount needed, please use the calculator to the right of this page to determine the amount needed. You will need two coats once the current stain is removed fully down to the bare wood. Forgot to mention, I have leftover Restore A deck stripper. Can I use this instead of Restore a deck cleaner? Yes, you can strip it off and then brighten before reapplying. Thank you. Do I need to apply stripper and brighter on the same day? Hello. 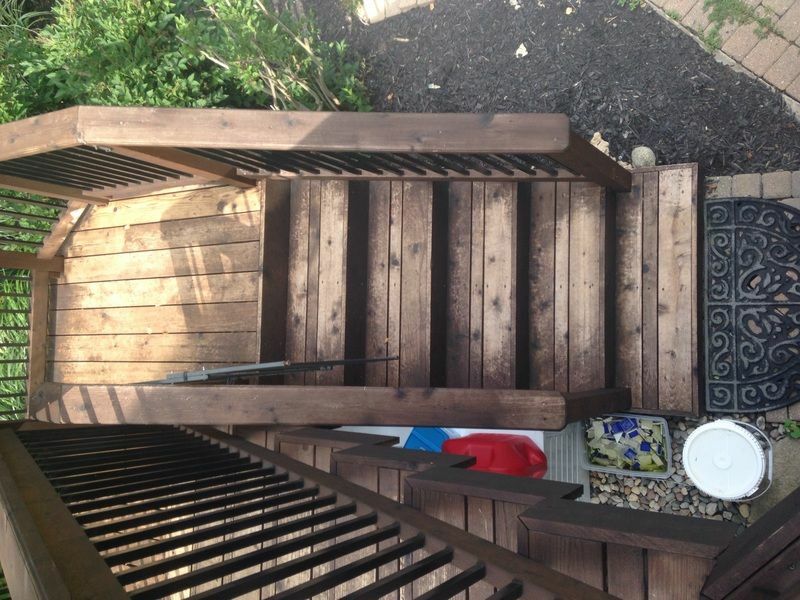 I applied Armstrong Clark Stain (Driftwood) to the stairs 2 years ago. 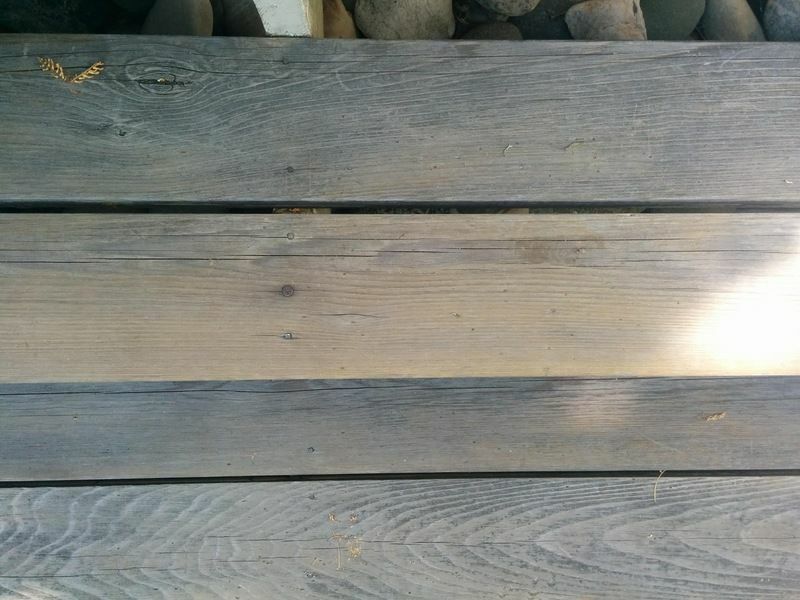 I just wanted to clean the stairs this year and used dawn (got an advice from Jake a few years ago for cleaning a deck) and noticed about 50% of the stain came off. It seems I need to stain it again. 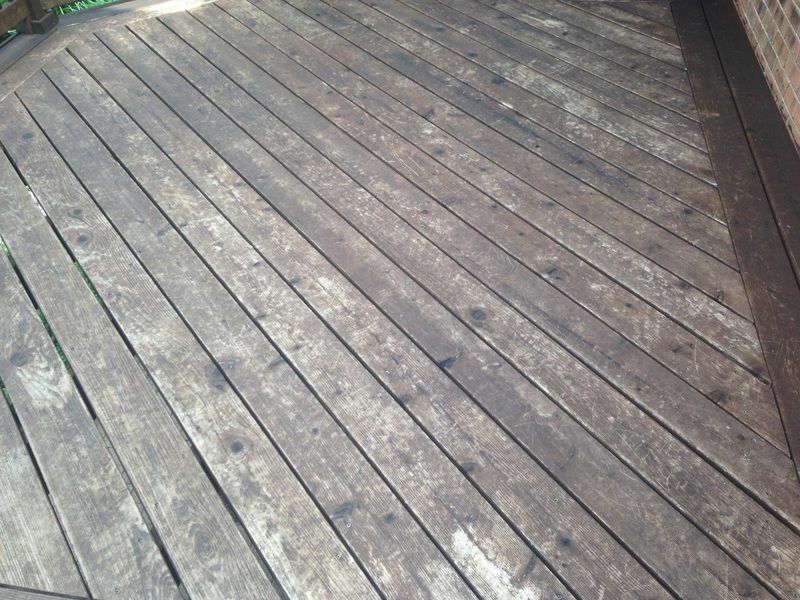 Do I need to use restore a deck cleaner before applying the stain or dawn is good enough? Please take a look at photos. I did not scrub very hard while I was cleaning since it was just a quick wash. I was not preparing for staining at the time. I have stripped/ brightened and sanded my deck one week ago, however rain is forecast in the 40 to 60 % range. I have purchased the semi transparent natural oak. My question is what would be the worst case scenario If it rains within 24 hours after application? It can handle a rain 12-24 hours after application. I built a small (SYP) deck last fall and purchased the A-C stain and 2-step prep kit. 3-weeks ago. I was amazed how clean the prep kit cleaned the wood of all the dirt//etc. We did have a lot wood 'fuzzies" however and what appears to be a very white, lace-like glaze over the deck. We were careful not to let the cleaner/brightener dry on the wood; so, we are a little dumbfounded as to determine what the white glaze might be and how to get it off. That is a result of the wood fibers being overly oxidized from the UV in the last 9 months. Might need to sand them off now. Try a floor buffer from a rental place and their sanding pads. It should come right off. Two years ago we stained our deck and wood picnic table and benches with Armstrong Clark Semi-Trans Cedar stain. We used the Restore-A-Deck kit before we stained the deck and furniture. I started cleaning the mildew off the picnic table and the stain started coming off. 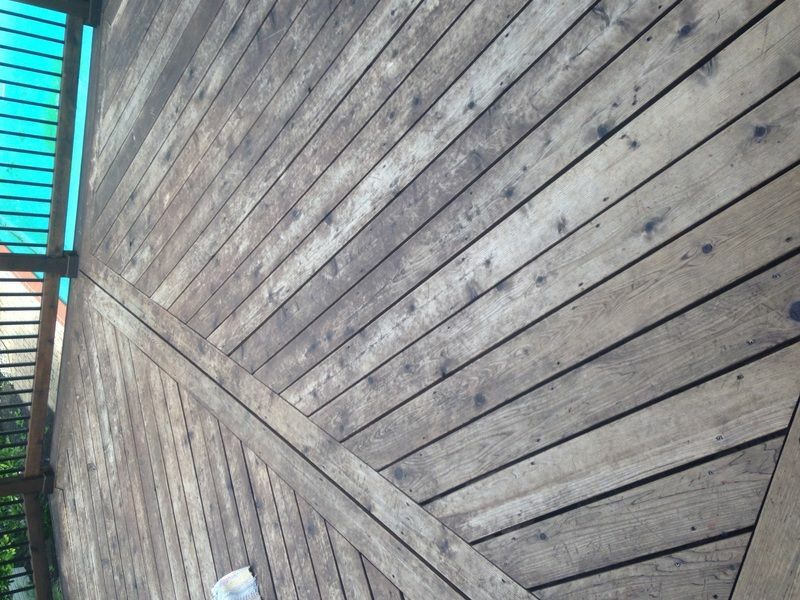 Before we use the Restore-A-Deck kit should we also strip the stain or is the two step Wood Brightener enough to prepare the deck and furniture? Hi, you need to use both the cleaner and the wood brightener for the prep, not just the brightener. Yes, I am ordering the kit with the cleaner and wood brightener. I will go ahead and place our order and not order the stripper. Thanks for your quick reply! I’m restoring a deck that is 15 years old and quite neglected. I’ve power washed everything, which made a big difference. I now have lots of wood fibers now that I intended to sand before staining. I read tonight that if it rains between the time I sand and apply the stain, that I will have to start over. My deck is 900 square feet and I’m doing all the work myself. It will be impossible to sand and stain without some rain as this will take me a couple of weeks. How concerned should I be able rain on freshly sanded wood before getting to stain? I do intend to brighten after sanding and before staining. No that is not true. Rain has no effect on the prep besides just letting the wood dry for another 48 hours. Thank you! I couldn't figure out how in the world I could prevent the rain for a few weeks and the deck is way too large to tarp.